Features Lionel coal and lumber accessories, bridges and cranes. We show all-new footage of each accessory in action along with rare variations, original boxes and tips on operating. Also included - a TM Exclusive - the 213 Lionel Lift Bridge in action. The 213 was cataloged in 1950 but never made. We have the prototype! Welcome aboard our action-packed video tribute to toy train accessories - the most clever and fun toys ever made. Toy Train Accessories, Part 2 The irresistible appeal of toy train accessories pass seamlessly from one generation to the next. The wide-eyed fascination of an eight-year-old today watching a culvert being unloaded is just as wide-eyed as it was back in 1957 when and Lionel introduced its 345 Culvert Unloader. Part 2 highlights the Lionel Culvert Loader and Unloader, the Lionel Newsstand, Water Towers, Dispatching board, Transfer Table with extension, Barrel Loader, Ice Depot, Diesel Fueling Station, Oil Derrick, signal towers, light towers, stations, trackside accessories and more. We show them in action, discuss the variations, and provide tips on installing and operation - even show some original boxes. Weather you collect or operate or just want to bring back some pleasant memories - you will enjoy this video. Lionel is known mostly for the O and Standard gauge trains. But they also made fine models in two smaller gauges - OO and HO. Overlooked by collectors for years, these two gauges are beginning to gain the recognition they deserve. Lionel called their OO Lionel for trains "gems of scale model railroading craftsmanship." And they were. Seeing these gems in action on OO layouts is a rare treat indeed. Lionel's HO line-up includes both scale and whimsy. We take a look at the Postwar and Modern eras, including FM C-liners, 0864-series boxcars, the Southern Pacific Daylight and the RailScope FA-2. See HO versions of O gauge classics like the Milk Car and Satellite Launching car. TM's first video history of Lionel produced in 1990. Begins with Lionel Cowan and ends with the scale Hudson being of Richard Kughn. See the classics that made Lionel great. Steamboy (Revere MA US) on 2017-05-08 13:05:06. This boxset is 100% marvelous! Disc 1 accessories part 1 was made in 1998. Disc 2 accessories part 2 was made in 1999. Disc 3 Double O & HO was made in 2001 with music from gene Michael productions and not James Coffey. 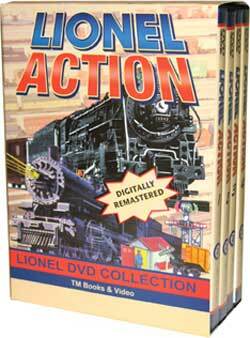 And disc 4 documenting Lionel's first 90 years was made in 1989-1990 with some newer footage from today.